SAVIC organic poultry : Challans organic chicken… naturally ! – Marked with an identification ring on the wing ensuring traceability from the farm onto your plate! High quality organic poultry bred in preserved natural conditions! Like in the old days, our organic poultry is bred in small flocks in the Vendee pine forests near the sea or in the open fields of inland countryside. They roam around large grassy and shady areas, cultivated in the traditional and natural ways, according to the current Organic Farming regulations. The whole production process is controlled by an independent certified body which audits the production chain, from the breeding to the selling stages, in accordance with the organic farming standards. 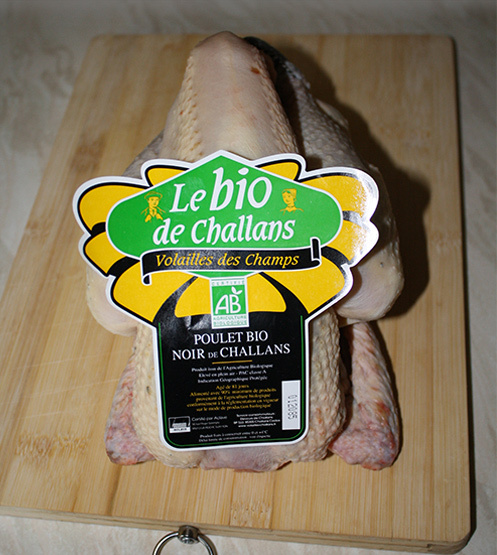 Organic Black-Leg chicken: eviscerated, oven-ready whole chicken or cuts. 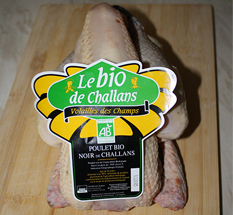 Top of our range, the famous Black-Leg Vendée chicken…you cannot miss it at the butcher’s! 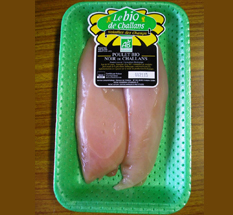 Organic Yellow-Leg chicken: eviscerated, oven-ready whole chicken or cut : you will fully enjoy its unique flavour, as well as its mellow and tender yellow flesh. Treat yourself to a true delicacy! Organic Guinea fowl : eviscerated, oven-ready whole guinea fowl or cuts. A gamey and most refined taste: a Xmas or New Year delicacy you can now enjoy all year around! Organic turkey and duckling : oven-ready or cuts. 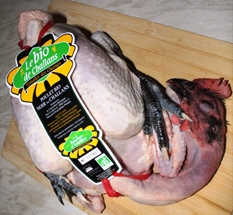 Don’t wait until Xmas to cook a traditional free-range turkey, bred outside in the Vendée pastures. Can also be hand-cut to order by your butcher. – organic free-range capon: unequalled and the obvious choice !